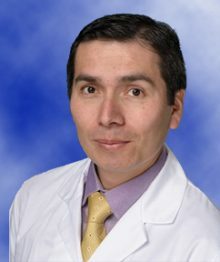 Dr. Chuquilin received his medical degree from the Universidad Peruana Cayetano Heredia in Lima, Peru in 2003. He completed his neurology residency in 2010 and neuromuscular medicine and EMG fellowship at Washington University in St. Louis, MO in 2011. He then joined the Faculty at the University of Missouri in Columbia as Assistant Professor of Neurology in 2011. He served as the multidisciplinary MU ALS treatment center Director at the ALS clinic which opened in 2015. He also attended the Muscular Dystrophy Association clinic at the University of Missouri in Columbia. He joined the Faculty at the University of Florida in 2016. Dr. Chuquilin is board certified in neurology (ABPN), neuromuscular medicine (ABPN) and electrodiagnostic medicine (AANEM). He is also a member of the American Association of Neuromuscular and Electrodiagnostic Medicine (AANEM) Electrodiagnostic Self-Assessment Examination (SAE) Committee since 2015. Dr. Chuquilin performs Botulinum toxin injection for migraine prophylaxis, occipital nerve blocks and skin biopsies to evaluate for small fiber neuropathy.